The first time I made this magic custard cake was more than half a year ago and it was made in Matcha flavour. My family loves it, not only are we amused by the three different textures, it tastes awfully good, believe me! I made this in orginal flavour for my dearest 91-year-old grandmother's birthday. I have chosen it as it is quite healthy unlike the usual cream loaded cake. The ingredients are simple and the major ingredient used in this recipe is MILK. You will need almost half a carton as 480g is required! Though this is my second attempt, I am still quite paranoid when I see the big curds after adding the egg white (meringue) to the watery milk batter. Do not discard when you see this happen, just continue folding the meringue until it becomes really small or disappear. You will be amazed when the cake reveals three different textures after you have trimmed the sides of the cake. The bottom layer is dense and taste like our chinese kueh, the centre layer is soft and custard-like and the top layer is a souffle cake texture. It is truly magical and so delicious that you can't stop at one piece! This cake can be eaten warm or cold. My personal preference is the latter as it tastes even better after chilled. Here's my maiden video done using an iphone with one hand videoing and taking photos while working with the other, very challenging! 1. Lightly grease and line a 8"x8" baking pan with baking paper, height taller than the baking pan by 2~3cm all around. 3. In a separate bowl, sift the flour, set aside. 6. Add in the melted butter and one tablespoon of water and beat for about 2 minutes or until evenly incorporated. Mix in the sifted flour until evenly incorporated. 7. Use a hand whisk and gently beat in the milk and vanilla extract until everything is well mixed. It is normal that the batter is watery and runny. 9. Pour the batter into the prepared pan and bake in a preheated oven 160ºC top and bottom heat for 50-55 minutes until the top is golden, test with a skewer, if no watery batter is seen on the skewer and comes out with slight crumbs, the cake is done. 10. The cake will be wobbly. Remove the cake from the mould. Together with the baking paper, cool it completely on a wiring rack before cutting and then dust with icing sugar. If you can't finish the cake within the day, it has to be chilled in the fridge to be consumed up in the next few days. *** It's a magical cake that forms into 3 layers when baked. 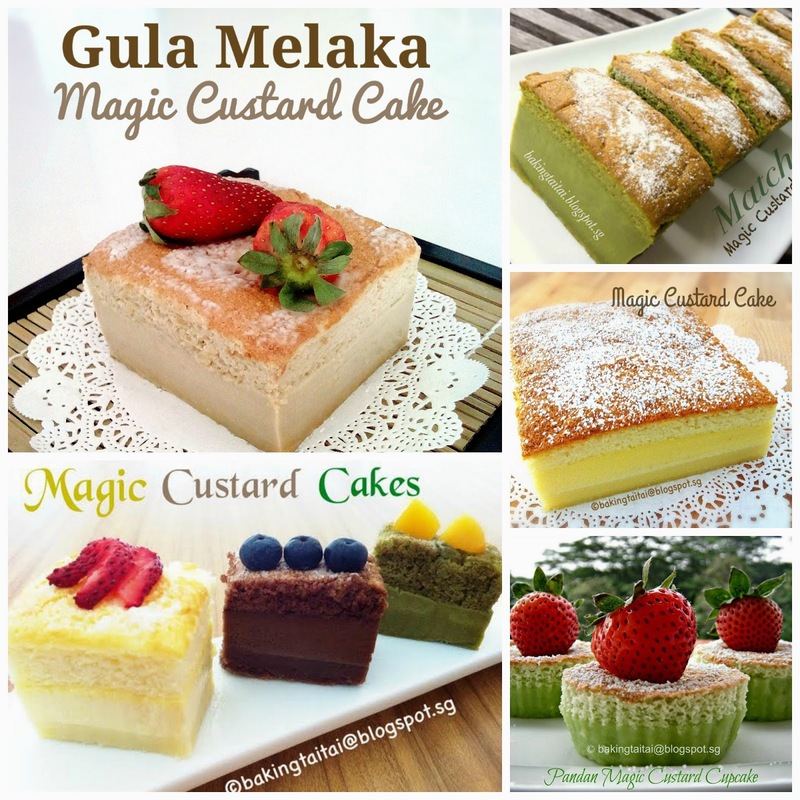 5 July 2014 - Invited by LessonsGoWhere as a guest blogger chef to conduct a baking workshop on the Magic Custard Cake. Click here to read more. Few people have shared with me that when the cake is baked, they only saw two layers, but after chilling it in the fridge, the 3 layers appeared! Wow...magic isn't it?! Click on the photo for Matcha Magic Cake recipe. Can I just oil the cake pan and try to knock knock a few times for it to come out if i dun have baking paper? Hi Cheryl, this is really a magic cake. Looks so pretty and good, esp . the height of it. Is it AA size eggs that you use? Can wait to try it. Thanks for sharing this recipe, the useful tips and the step-by-step photos. Hi Cheryl， first time for me to drop by here, glad we can get to know each other through blog linking! serious?! the cake forms 3 layers! first time for me to hear of magical cake! Thanks for linking with Little Thumbs Up! Hello Cheryl, well it's really magical ... 3 layers formed when baked. Nice cake! Thanks for sharing this recipe. Hi Angel, the first two layers of the cake is rather soft. The top layer is a fluffy sponge cake, the middle layer is custard-like and the bottom layer is dense and like Chinese Kueh. I am afraid if you knock it out, the cake would fall apart! Very lovely post Cheryl! Thanks for sharing and getting us all excited! :) It's interesting to whip the meringue first and let it rest because for chiffon, I've seen it break down a little and form bits and always have to throw it away. Haha! 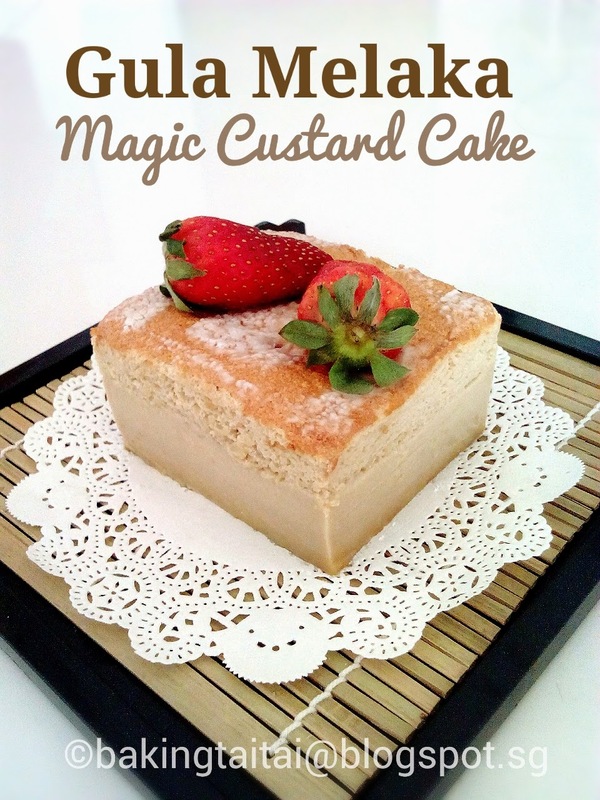 Maybe next time that happens I'll do magic custard cake instead! :p Thanks for sharing! Love your blog and bakes Cheryl! Hi hotmama, yes each egg with shell is 60g and the weight is about 55g without the shell. Thanks for sharing the recipe in CK. Am baking the cake right now as I am typing. I realised my top turned brown very soon at less than 30mins so I turned down to 150C and turned up again at 160C at last 10 mins plus a aluminium foil on top. How to determine if it's ready? I find it still abit wobbly when I wanna test the doneness. Thanks! This is going on my "To Bake" list! It's so beautiful and I'm sure the layers and textures are awesome! Thank you for the tutorial! Hi Simply Flyn, sorry for the late reply, weekends are busy and I do not have time to access my blog during the day. You have done the right thing to lower the temperature. The temperature in my recipe serves as a guideline. You will have to adjust according to your oven thermostat. This cake will be wobbly after done. You can put a skewer through the centre of the cake, if it comes out clean, your cake is done. How is your cake? Does it have 3 layers and how do you like the taste? It is can done by using multipurpose rice cooker? Hi Young Palace, I have not bake with a multipurpose rice cooker before. However, you can try it with the cake function. Even if you don't get the 3 distinctive layers, it is still a great tasty cake! I've try yesterday, what I get is fully custard. Is it I need to add more flour ? Hi Young Palace, probably the rice cooker is not suitable to bake this magic cake. I do not advise to add more flour as the magic in this cake is the little flour used that form one of the layer. Hi Lily, you are most welcome! Do try this cake as I highly recommend it for its great taste and textures! Caster sugar is finely granulated sugar, please see the photo showing the ingredients above for reference. Hi Justina, I would not advise you to use tracing paper as it does not have the non-stick properties and you may collaspe the cake while removing as it is a soft cake. Please do not use Aluminium foil in cooking/baking as studies have proofed that it is harmful to our human bodies, only use it for packing food. Thank you so much for this recipe Cheryl :) I made it for my dad's birthday and he loved it! 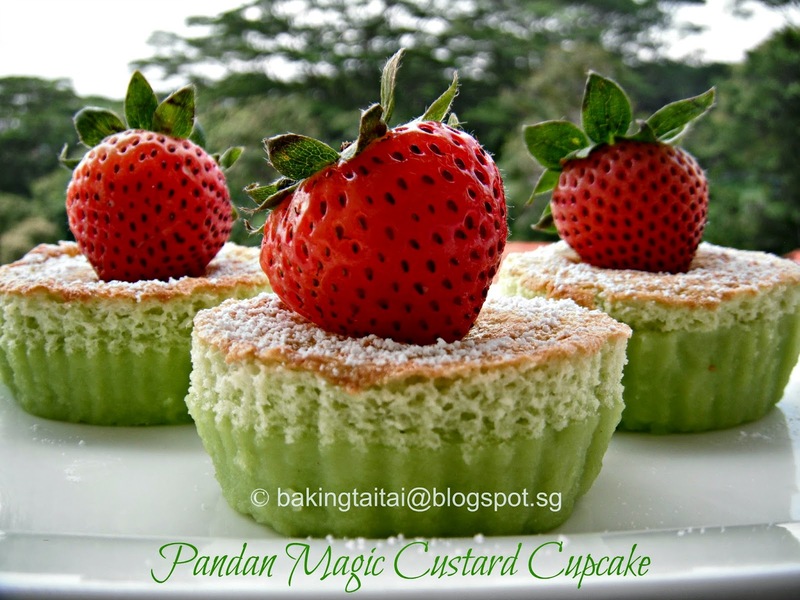 I have attempted to make this magic cake but was quite disappointed that it came out to b only custard layer. I wonder what has I done wrong during the baking process. One thing I did not follow your recipe was I didn't take out the cake from my removable base pan immediately after I took out from the oven. I only took out the cake from the pan after it has cooled down. Do you think it could be because of this it failed to form 3 layers? Hi Cheryl, thank you for ur reply :) I poke in to the bottom. I think I have same situation with below , only appear the custard layer , the first layer of The cake was very think only, so the cake is like custard cake xD I think because is I use auto fuction of owen to make cake that's why fail :( I set the temperature to 160℃ and 55min but my owen run out of the settings time so I use auto functions around 40min then after done I see still too soft so I set again 160℃ to bake another 20min. Still soft, then I scare over bake so stop bake it. So maybe is me didn't bake the cake well enough turn to 3 layer or 2. By the way I would like to show the picture for u but can't share on here. I will try to make it again ,haha, thanks for ur recipe. So glad i found this recipe; we have had it in our family for years from my husband's granny, but never had the recipe! Hi, Can replace plain flour with wholemeal flour?? Hi Cheryl, I really wanted to bake this cake, but my mum don't like butter, if replace the butter to oil, do you think it work for this recipe? Thank you for all your sharing and tips! As mentioned in my recipe, the flour will sink to the bottom during baking and form a dense chinese kueh like texture. If you use wholemeal flour, you may get a rough kueh texture instead. Hi soh, I have not tried using oil for this recipe and am unsure if it will affect the magic during baking due to difference in density. Also if butter is being replaced by oil, the cake will not be as frangrance. Good morning Cheryl, I also think that, will follow your recipe to bake this cake for the 1st time. Thank you for your advice, have a nice day ahead! Hi Cheryl, where did u buy your 8x8 square cake tin? I bought one at phoon Huat and it leaked! >< also I saw one silicon one in cold storage, ok to use those? Sorry for the late reply as I have been receiving too many emails and private messages until my family complains that I spent too much time replying baking questions and have too little time for them. Now I promised them I only reply questions on weekdays only. I got my San Neng square pan from a baking supplier shop in Hong Kong. You can take a look at their online website (twinsco.com) and they have few branches around the island. I have not tried baking with silicon bakewares before as I am quite skeptical using it for health reason. If you pan leaked, try to wrap a layer of aluminium foil around the base to prevent the leakage and ensure the baking paper is laid properly internally or use even two layers. Thanks for your detailed instructions and troubleshooting. I succeeded in making the 3 layer cake! However, it lost some of its height, would be be able to advise me why? Hi Jacqueline, it is normal for this cake to shrink after cooling down. Good to hear that you have achieved 3 layers successfully! Hi Cheryl, I hv baked this cake twice before and was well received. Recently, I thought of baking it again but someone who is very experienced in this Magic Cake mentioned in her food blog that Magic cake should be consumed on the following day or eat it only after has been refrigerated for 2 hours. If more than 2 days, cake texture turns rubbery. In the end, I did not want to bake for friends as they might take more than 2 days to finish. My convention oven do not have the topand bottom heat, the 2 heats are at the side, can i still use the same temp and time in this case? Hi huiying, I can't answer you on this as I have not used one with 2 heats at the side. However, you can experiment and adjust accordingly. I have tried baking it twice , into cupcakes case and whole cake.This cake is yummy.But my cake always turn out 2 layers only.Do u the the reason for this.Thabk you. Hi Xiuping, you may have under/over beat the egg yolk mixture or meringue, under/over fold the batter or overbake the cake. Do try again, a reader feedback to me that she finally got 3 layers after her 6th attempt of this mcc. I've tried this twice and I got a very thin (0.5cm) dense layer at the bottom and the rest of the cake is the sponge cake layer. What could be the possible reason the dense layer is so thin and the sponge cake layer is so thick? I was using Kitchenaid's beater attachment do the egg yolk step (vs your hand whisking). Will using the beater affect the result? May I know if you serve the cake with the baking paper and pan base at the bottom? Since the cake is so soft, I'm not sure how to remove the paper and base from the cake without breaking it. Hi Lynn, as the magic of this cake only takes place during baking, we aren't able to control the height of each layer. Everyone will have different results depending on the way they prepare and combine the batter and the meringue together. You mentioned that that you have a thin dense bottom and a thick souffle top, what about the soft custard layer? I removed the baking paper before serving the cake, as I cut the cake into slices, I lifted each slice up with the long knife and peel the baking paper off. Most people will chill the cake before cutting as they find it easier to handle when the cake is firmer after putting into the fridge. Hi Cheryl, I didnt get the custard layer on first try. On second try I got it but also as thin as the dense layer ie dense layer 25% of total height, custard layer 25% and cake layer 50%. My cake wasn't very tall, only about 1 inch :) but I'm very happy that I managed to get the 3 layers out even they are thin ;). I served the same way as you, removing the paper after cutting the cake into slices and before serving. I enjoy reading your blog and would like to start baking for my family. As i hope to follow your recipes closely, could you let me know what are sizes of baking pans that you use so that i can purchase them at one-go? Are they non-stick or alumimium ? Where are they available ? Why are pans with loose base needed ? Sorry for asking so many questions & thank you so much ! Do you produce recipe books for your cakes? I would love to buy a copy of the Magic cakes (all variations) from you.